So, here we are, Cardinal Nation, right around a third of the way through another grueling season. As fans, we held our breath through the off season, waiting to see what moves would be made, who would start the year on the DL, and who would excite us the most coming out of Spring Training. Out of the gate, we got a little nauseous after the unmentionable home opener but quickly realized that our team had the right stuff, and now here we are, boasting the best record in baseball. How great does that sound? Feel free to keep repeating it to yourself, or to anyone who happens to be within earshot. They won’t think you’re crazy, I promise. One might ask then, how can you possibly narrow down the list of reasons to love this 2013 team down to only 10? It’s been tough, trust me. But, here is Part 1 of my list, and I could probably make 10 more just like it. Have something to add? Comment below! 1. Those dang pitchers just keep throwing their nastiest stuff. The Mitchell Boggs Horror Show Saga aside, we’ve got the best pitchers in the game right now. 3 of our starters hold a top 15 spot in the National League rankings, “rookie” Shelby Miller currently ranked #1 on MLB.com. We’ve called up a staggering 6 rookie pitchers to make their debuts this year, all of which have contributed to our MLB best 2.96 ERA. Adam Wainwright has thrown 3 complete games and leads the team with 86 strikeouts. With Chris Carpenter on the slow but promising road to recovery and Jake Westbrook making a rehab start in Springfield tonight, it looks like we will have plenty of relief waiting in the wings if we should need it. Yadi deserves his own bullet on this star studded list. If the season were to end today, it would be laughable to not award Yadi the NL MVP award. He is the current NL average leader, coming in 3rd overall in baseball. After his minor disagreement with rookie ump Clint Fagan on Sunday, he came back with a vengeance on Monday against the hot Diamondbacks, hitting his 4th homer and collecting 2 more RBIs. He predicted the second coming rise of Michael Wacha during Spring Training, saying the kid was ready for the majors back then. He has caught the 6 rookie pitchers during their major league debuts and worked his Yadi magic on the Cardinal pitching staff as a whole, leading all of baseball with a 3.09 catcher ERA. If Yadi keeps this performance up, he will be an easy sell for MVP status, nevermind another Gold Glove. 3. This year’s I-70 Series. This year, I attended both of the home games against Kansas City. Prior to this year, I regarded this traditional series of Interleague Play with a sort of distant amusement. This may not be news to anyone else, but I came away impressed with the friendly rivalry that the Royals and Cardinals have. Residents of both Kansas City and St. Louis look forward to the I-70 series every year, and the camaraderie displayed by the Royals fans was entertaining, to say the least. And after watching Royals centerfielder Lorenzo Cain tip his hat and toss a fly ball into the bleachers, I was ok with welcoming the royal blue into our stadium (that’s ROYAL blue, not Cub blue, mind you). 4. Defensive support from Pete Kozma. Last year left a few question marks in everyone’s head regarding Pete Kozma. After a few notable bobbles in the infield, he returned to the starting lineup at shortstop after Rafael Furcal was sidelined indefinitely. Today, he is ranked the #1 shortstop in the National League, right above Troy Tulowitzki of Colorado, who some Cardinal fans were salivating after this off season. He’s turned 42 double plays, meanwhile maintaining a not-too-shabby .254 batting average. What is most noteworthy to me, though, is his willingness to learn and play wherever and whenever he is needed. His approach to the game reminds me a bit of a certain David Eckstein, who was happy to contribute in whatever way he could to get his team a win. And everyone needs a little David Eckstein in their clubhouse. 5. Matt Carpenter as our leadoff man. Matt Carpenter has firmly stamped himself as a solid leadoff hitter in the Cardinal lineup. He is crafty with his at bats, making pitchers earn their keep and keeping them on their toes. He leads the team with a .398 OBP, something you definitely want to see from your leadoff guy. Watching Carp #2 bat is something of a marvel: he will put you on the edge of your seat taking his count up to 3-2 and then come through with an extra bases hit just when you think he may not pull it off. Mike Matheny definitely made the right call putting Carpenter in the number 1 slot. I look forward to seeing him produce more runs throughout the rest of the season. 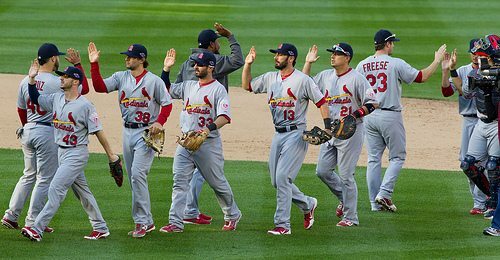 And there you have it, Cardinal fans: 5 solid reasons to love our St. Louis Cardinals right now. Stay tuned for the bottom (but no less important) 5 coming up later this week. Enjoy the rest of your week and let’s go for a Diamondback sweep! Sally Spickard a St. Louis native who grew up loving Cardinal baseball. Her favorite memories are winning the 2006 World Series during her 21st birthday week (yes, she gets a week.. or a month..) and watching Adam Wainwright hit a home run for the home crowd. She considers Opening Day to be a holiday, which is why she always takes the day off from work. She is also an avid SEC Football fan and is looking forward to seeing how Mizzou fares in the coming seasons in the SEC.